If you have ever owned property, you will probably know that almost everything that you do is basically two steps forward and one back. 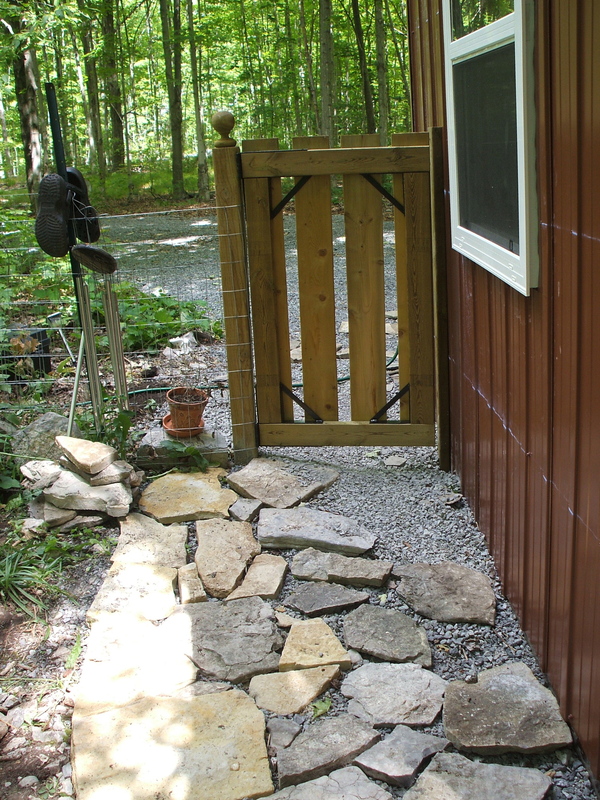 In my case, when the steel went up, the gate went down and the stone walkway which was just laying there settling, had to be removed. Today we had fairly good weather warm but with a nice breeze, so I resized the gate and put it back in. It also had to be turned around so that the hinge side is on the post and not on the house because I do not want a bunch of screw holes in the steel. Because I turned it around I also need to buy a gate hitch. I did not put the flag stone back into place because I did not have the time. Instead I had a shower at my sister’s home and drove to Kingston for the wake of my friend’s mom. I am slightly uncomfortable with going to services such as this in my bike because someone made fun of me when I attended one such service last year on the bike. Nonetheless, I think there are some things that cannot be helped. Today, both life and death have stumbling blocks and rocky paths. Still, the sun is shining and I am taking time to treat myself well. I have a comfy seat here where the coffee and service is great (at the Mug and Truffle at 350 King East.) and I am having a lovely cuppa with a treat… mmmm. If you get a chance to pop in for some air-conditioning and perhaps something yummy, tell them that Tiny House Laura sent you. If I am there, please say hi and please don’t sit at my table, unless you will share it with me.